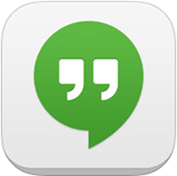 Google’s Hangouts app for iPad and iOS was updated yesterday, to Version 2.0.0. With this update the app is optimized for iOS 7 and also ‘fully optimized’ for the iPad. That fully optimized for iPad part suggests a major makeover – because this app has been an ugly mess on the iPad. It was comically bad when initially released, so just about anything would be an improvement. I’ve had a quick look at the app on the iPad this morning and it does look much better, though it’s still not going to win any UI awards. Hopefully Google will continue to improve this app on the iPad.